At the end of Tan Quee Lan St, the new and empty Kin Moo stood in great expectations. It was bright and clean, nothing special about the decor–cement floor, wooden tables, and whitewashed walls, rather nondescript–but there was an excited air of expectancy to become popular. 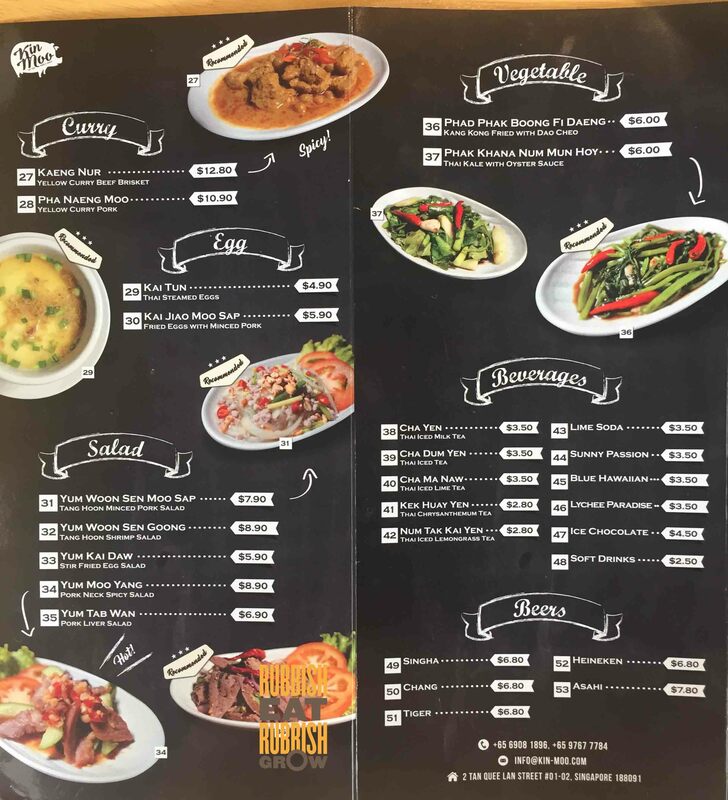 The staff greeted us enthusiastically when we stepped in and she explained their signatures to us: they are best for their Thai boat noodles. If we could eat spicy food, try the baamee haeng tom yum ($7.50), a dry tom yum noodles. No thanks. It wasn’t my detox LS day, so the baamee haeng cha kang rao ($7.90) would do. The manager (or boss?) said, Kin Moo is the first to serve cha kang rao in Singapore. Not sure if this is true but I’ll take his word for it. Cha kang rao has minced pork, pork ribs, peanuts, dried shrimps, garlic, and a generous serving of lard. On first bite, the sweetness of the peanut gives way to the fragrance of the garlic oil to an intense saltiness. It is overly salty for me and the pork is more bone than meat. I don’t appreciate that the garlic skin is thrown into the mix, although this is probably the traditional Thai way. When I eat a bowl of noodles, I’d like to eat everything in the bowl, but the papery garlic skin is an unpleasant texture, and it needed to be picked out from the noodles. Besides the cha kang rao and the tom yum noodles, they also recommend the Thai wanton mee ($6.90). But for diversity’s sake, we ordered a rice dish. 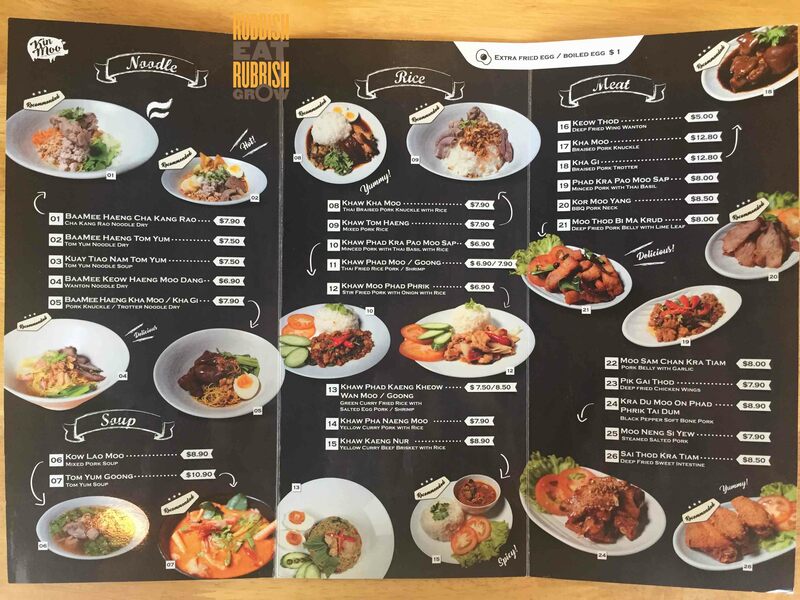 Initially, Mr Fitness wanted to order the khaw tom haeng ($7.90), mixed pork rice which has small intestines, a more interesting choice than khaw kha moo ($7.90), the braised pork knuckle rice. But I vetoed him. On hindsight, we should have gone with his pick. Not that there is anything wrong with the pork knuckle rice. It is not gamy, very tender, not fatty. It tastes like kway chap on rice. But there is more skin than meat, and I’d prefer more meat than skin. The chilli is also like kway chap chilli, zesty and not so spicy, serving to undercut the fattiness of the meat. We were, however, disappointed with kai jiao moo sap ($5.90), or omelette. We thought it would be the fluffy and crispy Thai omelette, but it turned out to be a usual one. Usually at this point of the review, we would give recommendations on how to improve the restaurant. But the name of the shop is already fixed; and nothing could be done to improve it. Naming is important because it gives a personal branding, but the KinMoo sounds too similar to the popular Kin Cow at Chinatown Point and Kin Mookata at Jalan Besar. The similarity in the names causes confusion for the consumers like me. As a result, the branding of Kin Moo would be eclipsed by the other two brands, which have been around longer. We paid about $30 for two persons including a drink each, and at this price point, it is hard to nitpick. It is a good meal, good experience, good service.